You’ve just gotten a new haircut and style at XEX. You feel and look great the rest of the day. Then you realize you have to go to bed at night and your hair might not look the same way in the morning. How do you maintain the great style you got at the salon? Here are a few tips. We want our clients to feel relaxed at XEX. We think it’s a great compliment when clients zone out and are able to destress while they are getting a haircut and style. If you want to make sure you can recreate the style you receive from your XEX stylist though, it’s best to pay attention while you’re getting your cut and style. Watch your stylist’s technique and the products they use to style your hair so you can try to replicate it later. If you’re not sure what the stylist is doing, ask them. Your XEX stylist will be happy to explain how they are achieving your look. 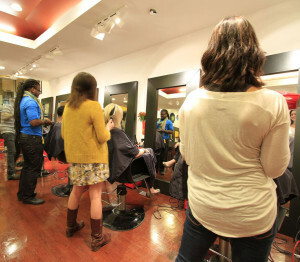 You can also ask your stylist which products you’ll need after your cut and style is finished. Before getting a cut and style, it’s helpful to discuss your daily routine and just how long you have to style your hair each day. If you’re planning on replicating the style you get at XEX at home, we want to ensure that the style works with your daily schedule. We don’t want to give you a style that takes a lot of work if you are really busy and don’t have much time to style your hair in the morning. Dry shampoo helps your hair stay healthy without having to wash it with water as often. Using a dry shampoo for a day or two after your cut and style will help to extend the look. Keep an eye out for the new Aveda dry shampoo coming in November!